connected to main box with accordion-style tubing paper. His design is part of the Exposure graduate exhibition of final year work by design, art, creative media and music students from the College of Creative Arts, which continues daily till November 17. His research, which included educating himself about the science of beekeeping, convinced him that while backyard variations of his concept existed, there was potential to pursue a product design that helps and motivates hobbyist beekeepers to recollect bee swarms. Hobby beekeepers typically use gloved hands to gather bees into boxes from the bush before transferring them into hives. Mr Brankin’s design would enable them to also capture bee swarms seen buzzing in less accessible places. “By making the recapture of swarms more accessible it improves the productivity for the beekeeper while helping the wellbeing of the bees,” Mr Brankin says. Swarming is biologically intended for reproduction of bee colonies with the queen bee laying a queen cell in the spring and summer period when she recognises the hive is thriving. Once the new queen cell hatches, the existing queen will leave with up to 80 per cent of the colony in search of a new home leaving the newly hatched queen to continue the cycle with the remaining 20 per cent of the bee population. In recent years the viability of bee swarms has been threatened by Varroa mites and outbreaks of American Foulbrood Disease. The latter disease, which only affects the larvae, has been present in New Zealand the longest, is the most widespread and extremely contagious, though efforts have been made to control it through legislation. The Varroa mite is a more recent invader, first identified in New Zealand in 2000, though since then has proved to be menacing presence for the industry. While not a usually a problem in a thriving hive, in autumn and winter when the bee population drops they can overtake a hive and destroy it. The spread and mite’s impact on bee populations can be minimised by isolating affected hives. It was is one reason why Mr Brankin opted to for his bee collection containers to be made of cardboard to ensure they were only used once and then burned to prevent any possible contamination. “In New Zealand if any hive is found to be contaminated it has to be burnt within seven days with all the bees inside as there is a concern with cross contamination. 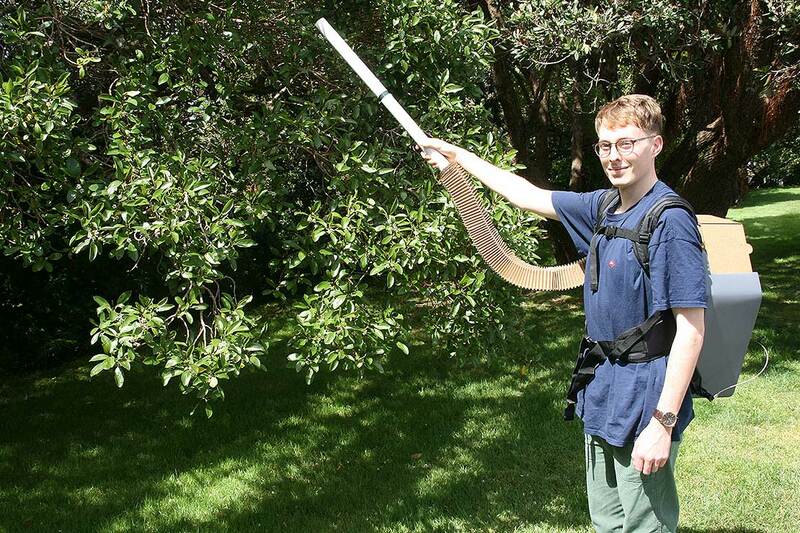 Any equipment used with that hive would have to be burnt within seven days too,” he says. 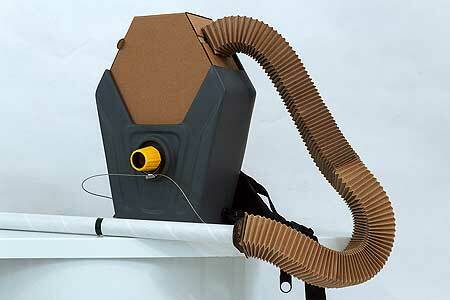 His prototype design comprises an imitation polyethylene plastic shell, a cardboard form box and recycled fabric rolls for the hose, which is connected to main box with accordion-style tubing paper. While its compatibility to connect to a battery or power source as used by an everyday vacuum cleaner is still being researched, other hobby beekeepers have expressed enthusiasm for its possibilities. “I think is has great potential,” Wellington Beekeepers member and queen bee rearer Mark Grenfell says. Before embarking on his final year industrial design project, Mr Brankin had little knowledge of beekeeping but is keen to try the hobby once he graduates.